Prior to January 15th of this year I had never seen a Purple Sandpiper. Now, Purple Sandpipers are easy to find; at least, The American Birding Association has said so, by giving them a number 1 (easiest to find) classification in the hierarchy of difficulty of finding the various species in North America. After locating Calliope Hummingbirds and Cassin’s Vireos in western Washington last spring, the Purple Sandpiper was my only unseen bird (with an exception to be explained) of the ~500 category 1 birds in North America. 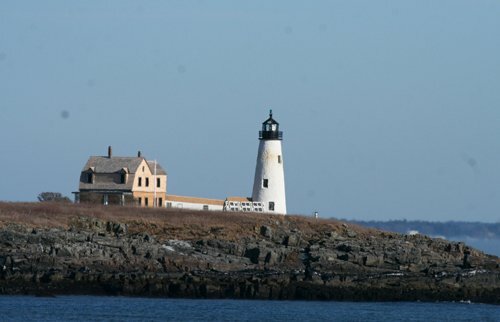 So with a few spare days on my calendar, I contacted my friend, Derek Lovitch, in Freeport, Maine, to see if he would be available as a guide. Derek owns the Freeport Wild Bird Supply store and works as a bird guide on the side. He was available and he met us early on the 15th at our Freeport hotel with one objective in mind: find the Sandpipers. The weather was bitter cold, at 0 degrees Fahrenheit, and the wind was strong. The sky, however, was bright with the early morning sun. Maine had just experienced its first real snow of the season, but unfortunately it had been followed by warming weather, rain, cooling weather and a glaze of ice over the snow. 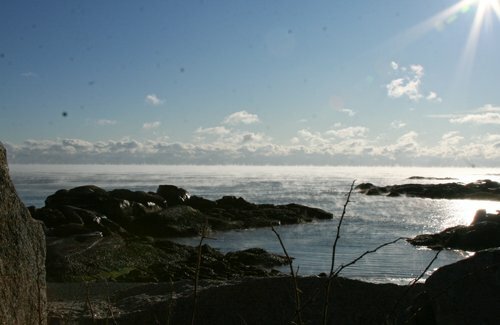 These are not the ideal conditions for exploring the rocky sea coast of Maine in January. Nevertheless, we bundled up in multiple layers of warm clothes, including the necessary long underwear, and began our exploration of some of the more likely coastal areas. At mid-morning we arrived at Biddeford Pond and walked out to the coast. There we witnessed the beautiful phenomenon called “sea smoke”, as white clouds, formed at sea level because of the interaction of the very cold air on the warmer water, rose from the surface and were swept out to sea. After a few minutes, as the sea smoke lessened, Derek spotted a flock of small sandpipers foraging at the surf-line on the black rocks of a small promontory several hundred yards across the water. 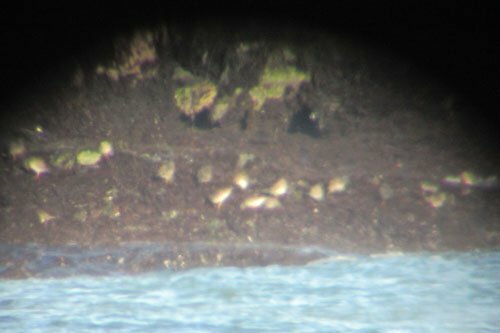 Scope views quickly revealed them to be a flock of about 25 Purple Sandpipers. Voila!!! The bright orange legs were alone sufficient to differentiate them from the potentially present Ruddy Turnstones and the much whiter Sanderlings, neither of which we saw. We watched them foraging on the rocks for several minutes. They then flushed and flew about in tight, whirling silvery arcs before coming back to rest out of sight on the back side of the promontory. In flight, there appeared to be about 35 in the flock. Derek says you never see one Purple Sandpiper; they are always found in flocks, and they tend to stay together. With mission accomplished, we had time to spare and proceeded along to coast. 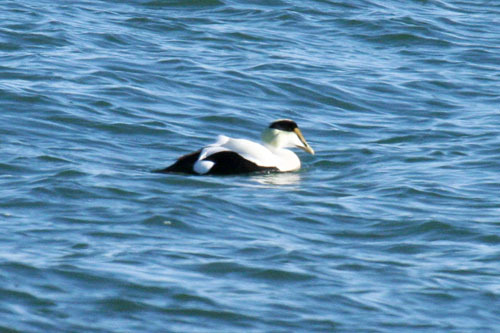 Among the birds seen well were Common Eiders, Harlequin Ducks, Common Goldeneyes, Black Guillemots, Great Black-backed Gulls, Herring Gulls, Ring-billed Gulls, and a few other water-oriented winter residents. We enjoyed our brief stay in Freeport. Lunch at Jameson’s Tavern and dinner at the Azure Restaurant were both outstanding (lobster, of course). Barbara enjoyed an afternoon exploring (shopping) the amazing L.L. Bean’s flagship store in Freeport. This winter has witnessed the largest Snowy Owl invasion Iowa has ever experienced, at least in my 77 year memory. Normally residents of the tundra in northern Canada and Alaska (and elsewhere in that latitude around the world), Snowy Owls in 2011 experienced a population explosion in their northland (probably due to an abundance of their main food source, lemmings), followed by a crash in the lemming population and a southward surge of young Snowy Owls, looking for food. During the Christmas Bird Count at Red Rock, a Snowy was reported south of Monroe, Iowa, just outside the official Red Rock Count Area. The 8 or 9 of us conducting the count caravanned to the location and were rewarded with a close view of a young Snowy, on a post in a ditch right by the road. Later reports over the Christmas holidays of Snowy Owls in Story County resulted in a couple of unsuccessful trips with my son-law from Oklahoma to try to find what for him and for my daughter and wife would be a life bird. Again, we apparently just missed the Owl after hours of patrolling the roads west of Ames. Then, early this week another (or the same) Snowy was reported just east of Ames. Barbara and I took off immediately after the sighting was posted on the Iowa Bird Line. 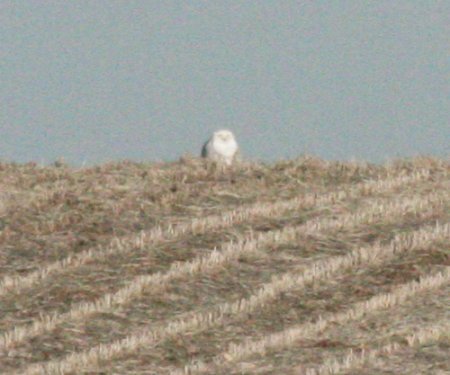 We were rewarded with a view, although somewhat distant for photography purposes, of Barbara’s first ever Snowy Owl.